It’s been 6 months since I started the concerted effort to pay down debt ASAP (truth be told, we had already been paying down debt prior to this, but at a much more relaxed pace). In some regards it feels like it has been much longer than 6 months, but in others it feels as though this journey has only just begun! I’m hugely proud of the progress I’ve made. I’ve mentioned before that in January 2014 I made a list of goals for the year and one of the goals was to have my credit card debt paid in full. Not only is that goal accomplished, but it was accomplished months ago, only 3 months after starting on this wild journey. So in that sense, I’m blowing my goals out of the water. At the same time, the more debt I pay down the more looming and monstrous the student loan debt appears. I feel like I had just put the student loans out of my mind while I was focusing on paying down other things (and they sat in deferment and continued to grow, and grow, and grow…). But now that they loom high on the horizon, the intimidation and fear-factor is real. It feels like an insurmountable obstacle. I know I can do it and I know it will be done. One day we will be debt free!!!! But at the same time, it feels like such a distant future that isn’t quite tangible at this time. (and now I’m going to be a weirdo and do a little Q&A interview with myself, heh). The hardest part has been putting some of my wants on the backburner right now. I remember starting this journey and others talked about how difficult it would be to cut back travel. I didn’t think about it much at the time, but I realize now just how often we did travel (it didn’t feel like it because it was just going to visit family – not exotic vacations or anything – but we did travel pretty frequently). I’ve had to forego my expensive hair cut/coloring, traveling to visit family as often as we’d like, and just many of the pleasantries in life that I used to do without a second thought (biggest one = eating out!!! I still struggle with this!) So it’s basically just learning to make do with what I’ve got and delay gratification until the future. What’s been easier than you thought? Honestly, once I really started sticking to a budget (which I’ve always made but used to be more of a guideline than a rule), everything just fell into place. I’m not saying I’m perfect because there are certainly budget categories that I struggle with, but having the accountability from you all has certainly helped. And now that I track every dollar, it’s just so easy! I don’t even have to think about spending money because I already know where each dollar is allocated. In a similar vein, I think that starting to live on last month’s income has hugely helped the budgeting process, making it much easier to track and stick with. When I talked about balance I told everyone I was going to stay nose-to-the-grind until March 2015, at which point I’ll let up steam a little. I think having a one-year time frame is really good for me. Of course we won’t be debt free by that point, but I don’t think I’d be able to stay as super-intense-focused as I need to for the full 3-4 years (or however long full debt repayment will take). Having a realistic deadline is really helpful. Whenever I’m feeling mopey about not buying something I want, I think that I can totally make it another 6 months. Of course I can!!! (Side note: I don’t want this to sound like I’m going to throw caution to the wind and spend-spend-spend come March 2015. But I do think it will be a nice breaking point to pause and reassess some goals and timelines for debt repayment. And FYI I am very proud to be credit card debt-free and will NEVER GO BACK into credit card debt again!!!). Definitely, for sure, blog away your debt! Lol. I joke, I joke. But seriously, I feel like having this platform has been a game changer for me. Having all of your immensely helpful suggestions, as well as your gentle chiding when I go astray has been incredible. There’s nothing like a public forum to keep you accountable, and I feel fortunate to have the opportunity! For most people (who don’t publicly blog about their debt), I would say that the written budget is key. And, also, there’s something that has to change inside you. I’ve heard Dave Ramsey talk about this and its so difficult to explain or quantify, but its like a switch has been flipped from “it would be nice to get out of debt so I’m just going to think about it and mull it over and complain about it” to “I AM GOING TO GET OUT OF DEBT…NOW!! !” I don’t know how you reach this point, but I think everyone has to get there. If you’re not there, it’s not going to work. Thank you all for being a part of my debt-repayment journey the past several months! I appreciate you all more than you know! I owe you all a debt update. I admit that some of the looming student loans have made me less-than-thrilled to add up the numbers (because the growing interest is just sickening and I don’t even want to see it!). But its been over a month (last debt update here), so it’s time. Be on the lookout for a debt update soon. I think you’ve done a great job. You’ve not only done a good job paying down your debt, but it’s all of the little things that you’ve changed along the way. Learning to make your own pumpkin spice coffee is one example that comes to mind. A lot of small changes add up. You’ve also done a good job listening and taking advice as well as being very transparent. As a reader, I appreciate that. It makes it easier for me to get on board when you are being upfront and honest about your income and your debt. One of the biggest determining factors of success is learning to make better decisions and you’ve done that. Bloggers that continue down a path when the consensus is telling them the decision doesn’t make sense, will always continue to struggle. Getting out of debt is about making better decisions more often. You have done just that. In terms of the student loan debt, I can imagine how it would seem overwhelming. Perhaps instead of looking at the total student loan debt, you frame each loan as a separate debt and focus on paying off one student loan debt, then another, etc. 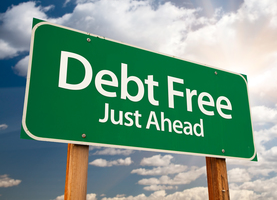 You didn’t incur the total amount overnight so it makes sense that you get rid of the debt the same way you incurred it, a little at a time. I was also thinking about the student loan debt and your desire to be a professor. The best way to show you value the education is to pay off the debt. I know you value the education but I am trying to think of a way to frame it…sometimes thinking about things differently helps us get to our goals faster. And finally, how cool would it be to interview for a job and be able to say you don’t have any student loan debt? You will make it, just keep setting your goals and stay focused. Life goes on and as you can see, there will always be something that will come up nearly every month. The sooner the debt is behind you, the easier it will be to move forward. Thanks for letting us follow along on your journey. Said so much more eloquently than I would have! I have seen big changes in the way you are thinking about spending decisions and everyday finances. Keep at it! The student loans will be gone if you do. Another way to frame thinking about the student loans is that you don’t want your girls to think that amassing that much debt is a good idea or “normal”. Nothing debt related (*pause* great job, keep it up! ), but are you effected by the flooding caused by Odile? Not at all. We actually had really bad flooding last week (1 person actually died here in Tucson, though flooding in Phoenix was even worse). This week there was a lot of flooding expected. They shut down half the city (all the downtown area) and a ton of businesses closed early to keep people off the street. In my area (I live slightly outside the city limits), they were even passing out free sand bags. All this and then….nothing. It drizzled for about 5 minutes and that was it. To be fair, there were scattered showers (just nothing in my immediate area), but still nothing on the level of what was being forecast! Good to hear. I thought you were in Tucson, and when they showed some of the damage on the news over here, and people filling sand bags, I was all “damn.” Then they showed damaged houses and I thought of your hubby and his flooring business. Always terrific to take a second to pause and reflect. You’ve done an amazing job, both with your debt and with this blog. Anyway, take it one day at a time!